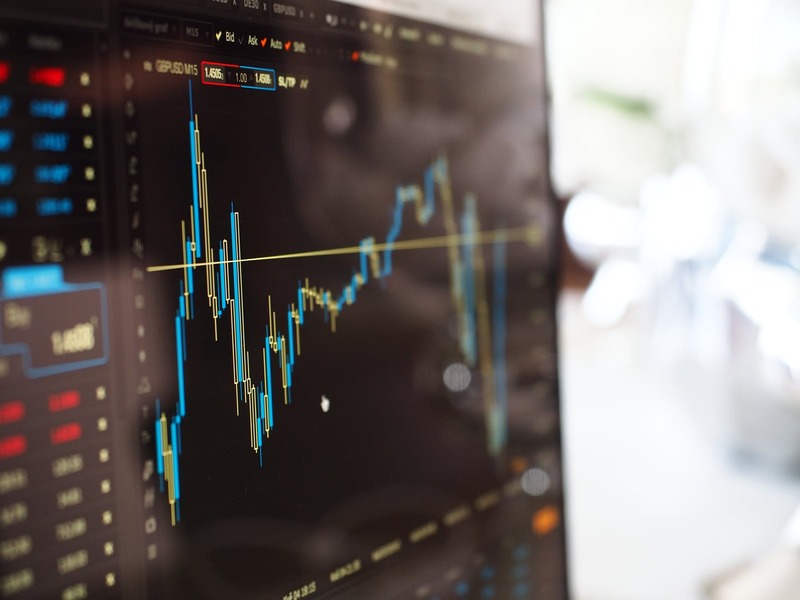 Price Action Analysis (PAA) is an important concept in trading, whether you’re a Day Trader, Swing Trader, or Position Trader. PAA is an in-depth Price Bar / Candlestick study (knowledge) that will help give you an “EDGE” over other Traders because most traders do not understand or take the time to learn what these trading principles mean. Price Action Analysis is what we like to call “Plain Vanilla Trading” - you do NOT need to use any indicators/oscillators when determining where the market is most likely going to go next or at what levels the market is most likely going to test. 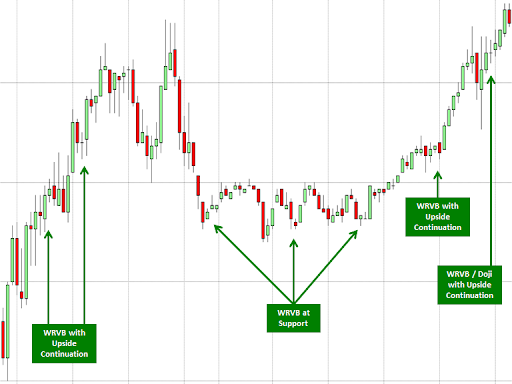 60 &/or 30 minute charts (YES it even works on smaller 3 & 5 minute charts). …An “EDGE” over Other Traders, since most other traders do not take the time to learn what these trading principles mean, they don’t understand the impact PAA has on market price movement. PAA is what we like to call “Plain Vanilla Trading” - you do NOT need to use any indicators/oscillators when determining where the market is most likely going to go next or at what levels the market is most likely going to test. So, while many other traders wait for another indicator confirmation, you will be able to see the REALITY of what is going on, and more importantly, what is likely to happen NEXT! 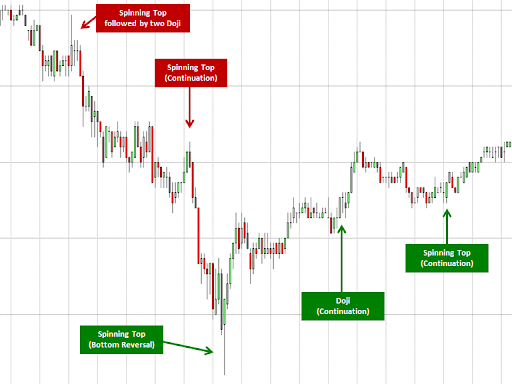 You will often hear experienced traders agree on one thing: “That a market is a market!” The Powerful Price Action Patterns taught in this series are based on the fact that markets are markets, and that LOW RISK, HIGH REWARD potential is available every day simply by deciphering strength or weakness through Price Action Analysis. Since accurate Price Action Analysis clarifies market REALITY you will find that with a little practice you will want to take down some of the mind cluttering overlays often found on some struggling traders charts (i.e. remember the ‘spaghetti’ analysis paralysis charts). 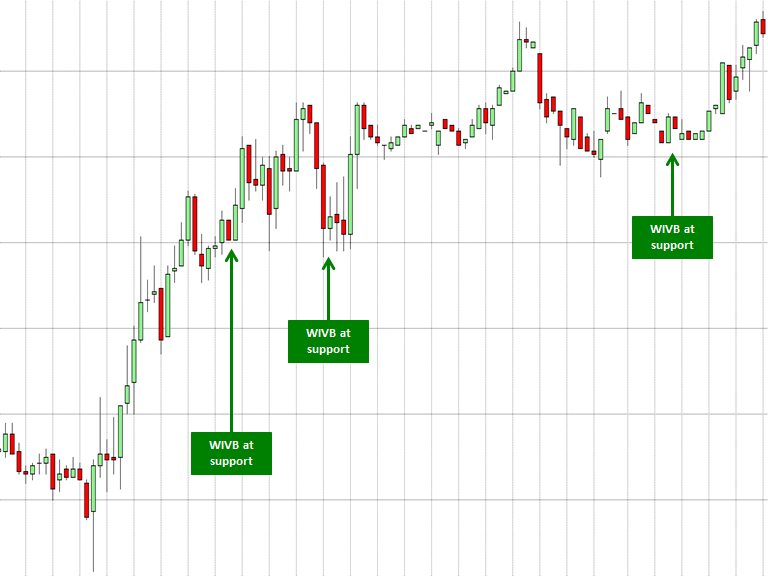 Price Bars or Candlesticks with a RANGE that is notably SMALLER than average. Price Bars of Candlesticks with a RANGE that is notable LARGER than average. 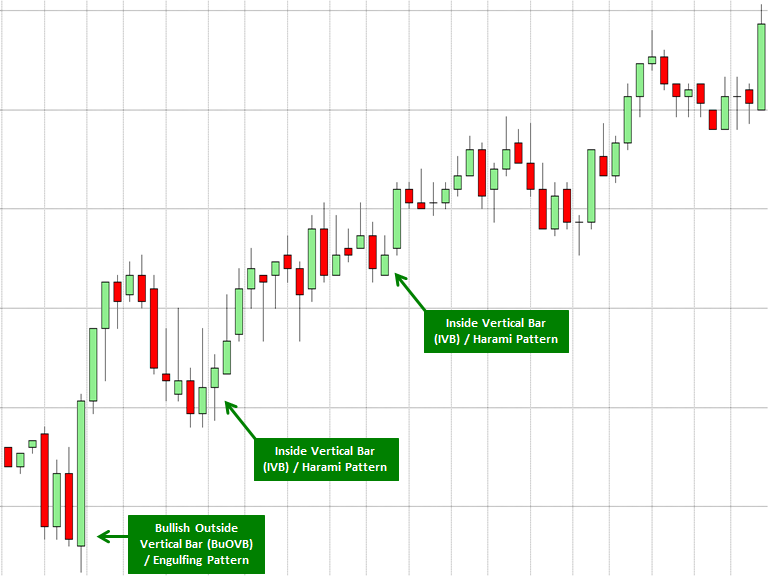 Price Bars or Candlesticks with a RANGE that is completely INSIDE the previous bar or candlestick’s range. 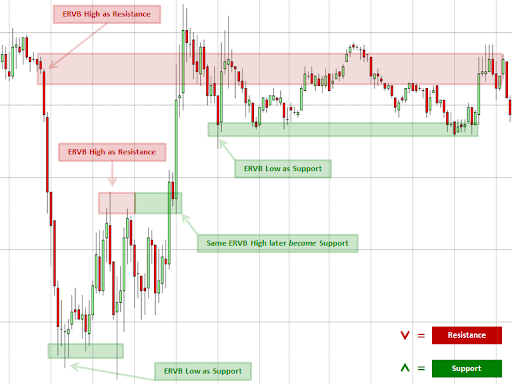 Price Bars or Candlesticks with a RANGE that is completely OUTSIDE the previous bar or candlestick’s range. 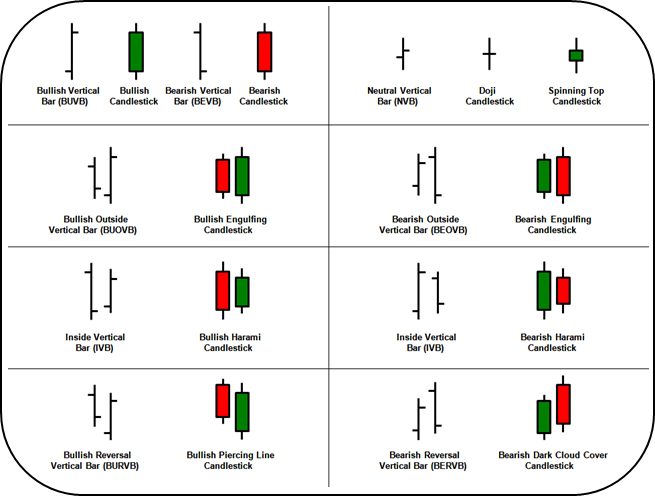 Price Bar / Candlestick Analysis means to interpret what the OPEN, HIGH, LOW, andCLOSE did on a particular Price Bar / Candlestick and compare that criteria to the previous Price Bar / Candlestick in order to make intelligent conclusions about the market. 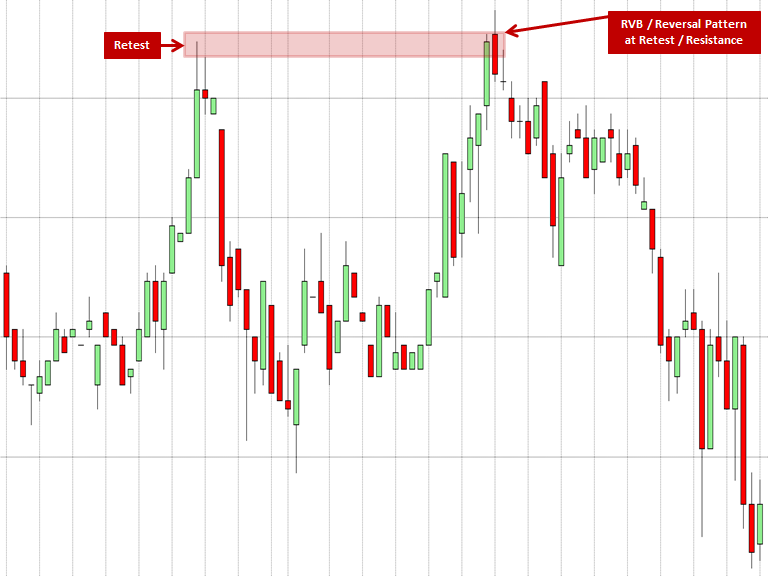 The Price Bar / Candlestick’s CLOSE helps confirm price action. The Price Bar / Candlestick’s RANGE (HIGH minus LOW) confirms momentum. NOTE: Chart Illustrations and Diagrams are shown in both Price Bars and Candlesticks so as to appeal to different trader’s personal preference of charts. Price Bar/Candlestick Analysis also provides the Trader precise insight as to where the market is most likely going to trade next or at least what areas the market will most likely test. It will help you tremendously in zeroing in on what the market has done recently and what it’s most likely going to do next – with a HIGH PROBABILITY. First… is the market TRENDING or trading SIDEWAYS? Third… analyze the previous Price Bar/Candlestick. 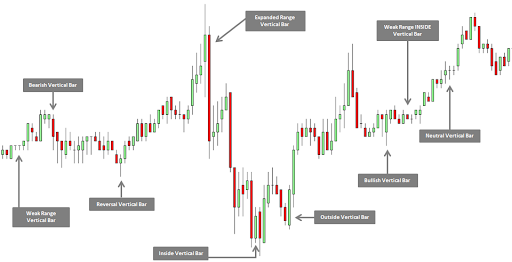 Each Vertical (Price) Bar/Candlestick taught here says something about the market and, when you know the meaning behind each one of them, you will be able to determine what the market is most likely going to do on the following Price Bar/Candlestick. These nine price bars are very reliable and predictable, offering high probability and low risk trading opportunities, when trading at logical SUPPORT in a defined UPTREND and/or at logical RESISTANCE in a defined DOWNTREND! 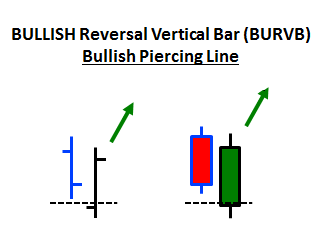 The Bullish Vertical Bar (BUVB)/Candlestick is when the CLOSE closes ABOVE the OPEN and in the TOP QUARTER of the Price Bar / Candlestick’s RANGE. The Bullish Candlestick will make a HIGHER HIGH and a HIGHER LOW than the Previous Bar/Candlestick, while CLOSING in the TOP QUARTER of the Price Bar’s/ Candlestick’s RANGE. This price action suggests the BULLS won and the likelihood of the market continuing up on the following candlestick is probable. 2. 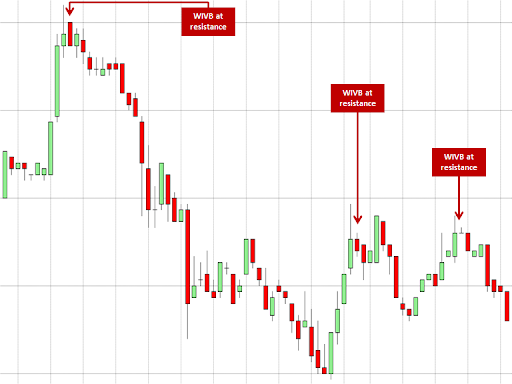 The Bearish Candlestick is when the CLOSE closes BELOW the OPEN and in the BOTTOM QUARTER of the Candlestick’s RANGE. The Bearish Candlestick will make a LOWER HIGH and a LOWER LOW than the Previous Candlestick, while CLOSING in the BOTTOM QUARTER of the Candlestick’s RANGE. This price action suggests the BEARS won and the likelihood of the market continuing down on the following candlestick is probable. 3. The Neutral Vertical Bar/Doji or Spinning Top is when the CLOSE of a Candlestick is EQUAL or within a few price increments of the OPEN of the same Candlestick AND the OPEN and CLOSE are near the MIDRANGE (50%) of the Candlestick. When a Doji or Spinning Top becomes an Inside Vertical Bar/Harami (discussed in next email) coupled with being a Weak-Range Candlestick (also discussed in next email), it makes the Doji or Spinning Top most neutral. This type of Price Action denotes uncertainty in the market and may indicate a reversal and/or are found near a reversal in the market. Dojis or Spinning Tops may also indicate that a Trending Market may be stalling just before resuming in the direction of the original TREND. 1. The Engulfing Pattern is when the HIGH is Higher than the Previous Candlestick's HIGH and the LOW is Lower than the Previous Candlestick's LOW. the market is beginning to TREND in the direction of the CLOSE of the Engulfing Pattern, unless the market is trading inside of a Trading Range. It’s especially important to note where the Engulfing Pattern CLOSED and what extreme of the Previous Candlestick was exceeded first (the HIGH or LOW). 2. The Harami Pattern is the opposite of the Engulfing Pattern. The HIGH and LOW both must be INSIDE the Previous Bar’s/Candlestick’s RANGE; therefore, the HIGH must be Lower than the Candlestick’s HIGH and the LOW must be Higher than the Previous Candlestick’s LOW. the Harami Pattern occurs roughly 10%15% of the time and suggests indecisionin the marketplace, whether a market is Trending or Non-Trending. 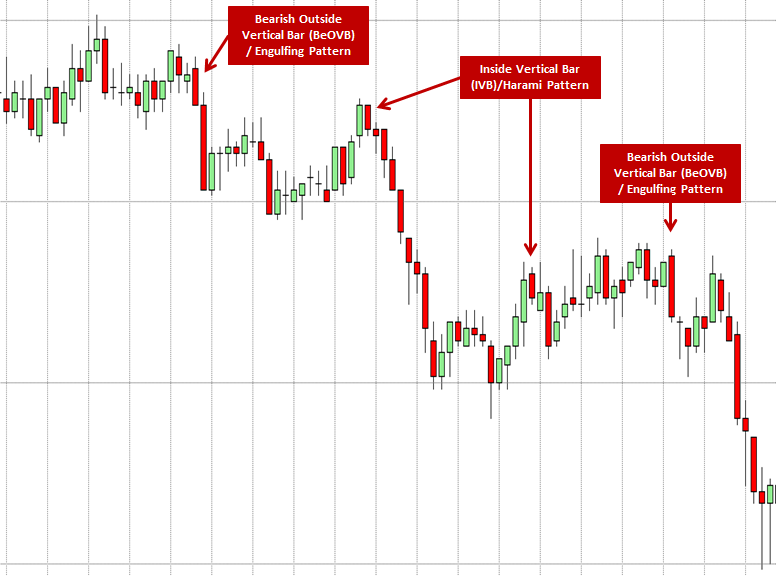 Volatility usually increases within a few Candlesticks following a Harami Pattern. The Harami Pattern represents indecision in the market; therefore, it is better safe than sorry to begin tightening up stops once this particular Price Bar / Candlestick Pattern is observed. 3. The Expanded Range Candlestick is roughly 250% greater than the average range of the last ten or more Candlesticks. a Neutral Doji or Spinning Top. 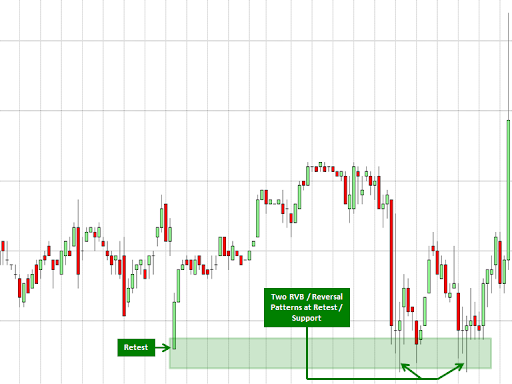 The ERVB Candlestick usually denotes that either a TREND is beginning or that a Trading Range is just starting; regardless, the following Candlestick or two usually will be dull with little volatility before really starting to move again. Since the Expanded Range Candlestick range is large in nature, it’s completely normal for a market to trade within the RANGE of the Expanded Range Candlestick for the next couple of Price Bars / Candlesticks. ​ 2 more important candlesticks you need to know to help you become more profitable in your trading, and really help equip you to be the best trader you can be. Bar/Candlestick is the smallest range (HIGH minus LOW) of the average range of the last ten or more Candlesticks. Either way, a market generally will make an explosive move in either direction, and an increase in volatility is likely to occur. The Weak Inside Harami is the smallest range (HIGH minus LOW) of the average range of the last ten or more Candlesticks with the HIGH and the LOW both INSIDE thePrevious Candlestick’s Range. 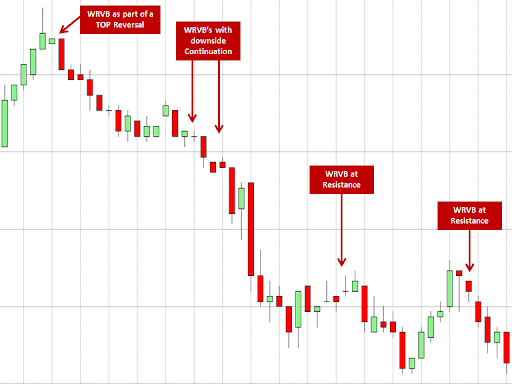 The Weak Inside Vertical Bar (WIVB) / Harami is a very powerful “breakout trade set-up” because of the small size of the Candlestick’s RANGE. You should pay special attention to the Weak Harami because a market will generally make a large move through the HIGH and/or LOW (if not both) of the Weak Harami on the following Candlestick (thus creating an Engulfing Pattern). The more Weak Harami’s you get in a row, the more powerful the “breakout trade setup” becomes. Alright, let’s get right into the LAST candlestick you need to know to help you become more profitable in your trading, and really help equip you to be the best trader you can be. A Reversal Candlestick should warn you that the market is trying to reverse – at least for the short term. 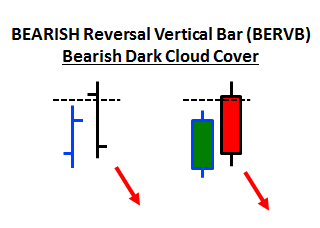 The Candlestick following the Reversal Candlestick should have at least some follow-through in the direction of the CLOSE of the Bearish Dark Cloud Cover or Bullish Piercing Line. If a market is weak (strong to the downside) and a Bullish Piercing Line occurs while the market is testing a Major LOW followed by some follow-through to the upside, the market may be setting up for a potential double bottom. Thus, when a market is testing a Major LOW combined with a Reversal Candlestick, we like to call this a Key Reversal Candlestick. This just paid for my trip to Maui. Am glad I took my laptop on vacation. I’m up over $2,500. Thanks for a great trade. -Chuck H.
Made over 125% in no time at all. Best investment I have made in five years. -William A.